Aboriginal Art Gallery in Port Douglas – Ngarru- Contemporary Aboriginal fine art is a vital element of the oldest continuous cultural traditions. Contemporary Indigenous fine art is also one of the most brilliant and exciting eras of modern art. Art is a central part of the life of Indigenous Australians and takes many differing forms. Traditionally Aboriginal art was made for purely cultural reasons and was only allowed to be created and viewed by people who had been initiated to the proper level of knowledge. In the recent past, Aboriginal artwork has been made specifically for the purpose of public viewing. For many Indigenous artists, their artwork remains inspired by the traditional marks and symbols from the Dreaming and the artist’s particular “country” or land. Ngarru Aboriginal Art Gallery is a supplier of authentic contemporary Indigenous fine art in Port Douglas. Located on Macrossan Street in the heart of Port Douglas, Ngarru Aboriginal Art Gallery sources art works from a number of established aboriginal artists. Ngarru Aboriginal Art Gallery also mentors and promotes emerging indigenous artists. Ngarru Aboriginal Art Gallery is totally dedicated to the Indigenous artists that display their works of art in the Gallery. The authenticity of the art and the mentorship program of Ngarru Aboriginal Art Gallery is what really sets them apart from the crowd. The Ngarru Aboriginal Art Gallery is a breezy,bright and colourful space. A visit to Ngarru Aboriginal Art Gallery is an experience that visitors and collectors of contemporary Aboriginal Fine Art will enjoy immensely. The knowledgeable and informative staff of Ngarru Aboriginal Art Gallery are a wealth of information, and will delight in taking the time to answer your questions about the artworks on display. At Ngarru Aboriginal Art Gallery there is also a number of highly collectable artefacts which include Maningrida spirit figures and fibre weavings, Tiwi Island sculptures, as well as a range of didgeridoos. The didgeridoos of Ngarru Aboriginal Art Gallery are termite hollowed in the traditional way. 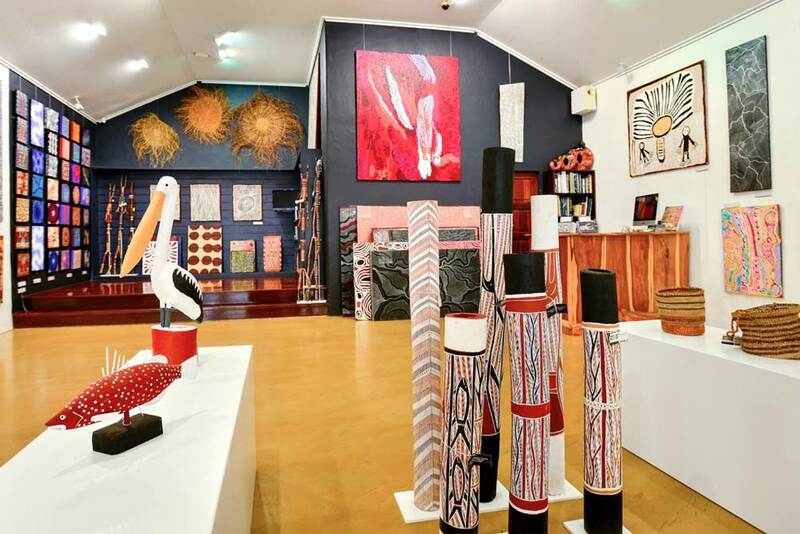 Visit the Ngarru Aboriginal Art Gallery in Port Douglas or view their Gallery to appreciate the amazing diversity of Aboriginal fine art and culture on display. This entry was posted in Holiday tips, Port Douglas News and tagged Didgeridoo, fine indigenous art, Indigenous Art, Maningrida Spirit.